Microwave the grated cauliflower for 4 minutes or until tender. Leave to cool. Add the lamb mince, pine nuts and all the vegtables except the cauliflower to a heavy based saucepan and cook until the mince in browned and the vegetables are soft. Add a little bit of water then stir in the tomato paste and vegemite and simmer down gently. When most of the water has evaporated, take off the heat and leave to cool before mixing through the mint leaves. Blend the cauliflower, egg and garlic until smooth and creamy. 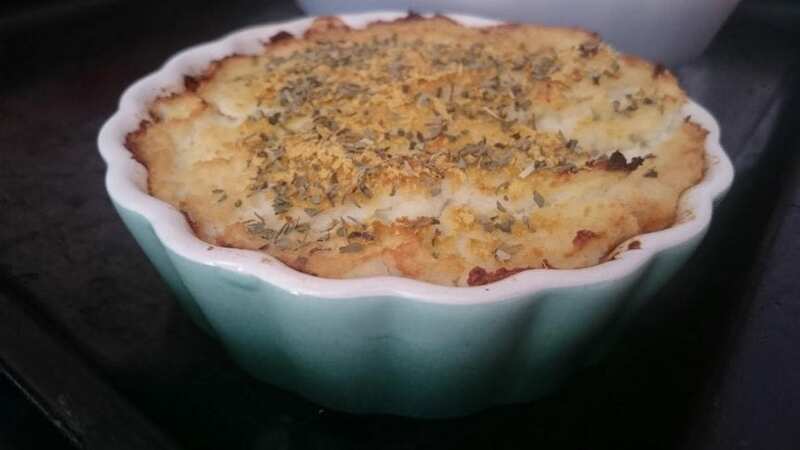 Place the meat mixture in the bottom of a casserole or baking dish and then layer the cauliflower on top. Sprinkle with nutritional yeast and some dried herbs before baking for 25 minutes or until the cauliflower topping is golden.